Primary Natural Resources coffee, bananas, agricultural products. 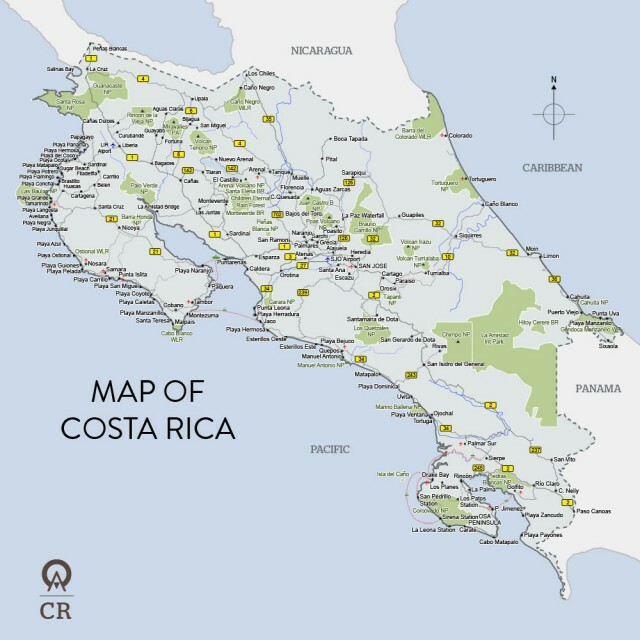 THE REPUBLIC OF Costa Rica, home to almost 3.9 million people, is located in Central America between NICARAGUa and PANAMA with CARIBBEAN SEA and PACIFIC OCEAN coastlines. With a narrow Pacific coastal region, Costa Rica is covered by rugged mountains with peaks over 12,000 ft (3,657 m) high, cutting the country from northwest to southeast. The chain contains several major volcanoes, one of which, Irazu, erupted destructively in the mid-1960s. Costa Rica suffers from occasional hurricanes, earthquakes, and floods in addition to volcanoes. The coastal plains are low and subject to flooding, as well as being quite hot, humid, and heavily forested. The traditional Costa Rican economy was based upon the agricultural production of these coastal plains, where it is possible to cultivate an abundance of bananas, cocoa, and sugarcane. In contrast to the wet coastal plains, the Nicoya peninsula located in the northwest region of the country is made up of more arid plains. There, extensive cultivation of cash crops like sugarcane is not possible. Instead, these plains have been used by ranchers to raise large herds of cattle and by some farmers who grow grains. The Central Valley lies between the mountain ranges and volcanoes, where the most productive land is found and coffee is cultivated extensively. Also, under the threat of an eruption, the majority of population lives in the Central Valley, which is the heart of the country and is renowned for its almost constant springlike climate. In addition, Costa Rica has sovereignty over a small island about 300 mi (482 km) off its Pacific Coast, known as Cocos Island, which is celebrated for its natural beauty. The climate of Costa Rica is tropical and subtropical. The dry season lasts from December to April, while the rainy season lasts from May to November. While it is quite hot and humid along the coastal plains, the Central Valley and the highlands are much more agreeable. In some areas of the highlands, the temperature varies greatly from that of the coastal areas. Costa Rica is a democratic republic separated and administered in the form of seven provinces. The executive branch is made up of a president and two vice presidents, a unicameral legislature, and a Supreme Court. Costa Rica is one of the most stable countries in the Americas; only two very brief periods of instability have taken place since the late 19th century. As a result of the stability, the government has been able disband the military and to concentrate on economic development. Even though Costa Rica is still mostly dependent upon its agricultural exports, diversification of the economy has succeeded in moving the country away from monocultures. After the success of government initiatives, Costa Rica is now home to expanding ecotourism and technology sectors. Consequently, the standard of living is high, especially relative to neighboring countries, and land ownership in the country is widespread.